The Employee Provident Fund (EPF), also simply called as Provident Fund (PF), is the most popular and default investment destination for salaried employees. If you are a public or private sector employee, it is most likely that your company is registered with the Employee Provident Fund Organisation (EPFO). The EPFO is governed and regulated by the Government of India. The EPF is a tax-free investment instrument having an Exempt-Exempt-Exempt status. The PF contributions made by the employee are eligible for tax deductions under Section 80 C, the interest earned on the total EPF investments and the withdrawal (including partial withdrawals for specific expenses) are exempt from the purview of taxation. Given their regular monthly contributions, many employees are interested to know their EPF balance or PF balance. This interest increases towards the end of the financial year, as the employees find out how much of the Section 80C limit has been utilised. With the advancement in technology, the EPFO too, has improved its processes and systems. Today, there are multiple ways to check your EPF balance online or on a mobile. You need not have a smartphone or access to the internet to check EPF balance on mobile, and even a feature phone can be used. But before we get into the different routes you can check the EPF balance, let’s discuss some important prerequisites. 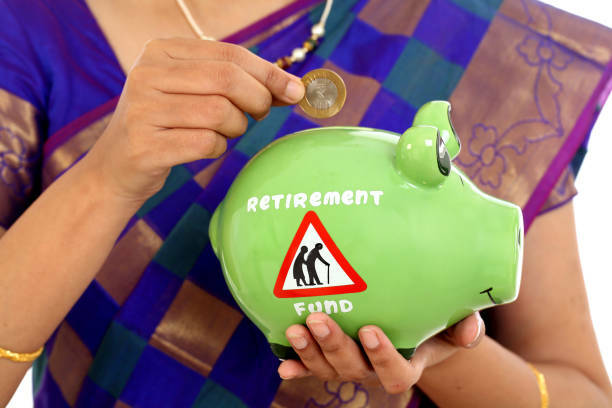 The EPFO has introduced a Universal Account Number for all EPF subscribers. The UAN is a unique 12-digit number for all individuals enrolled under the EPF scheme. The UAN remains permanent even when you switch your employment. You can activate the UAN by logging in to the EPF website. 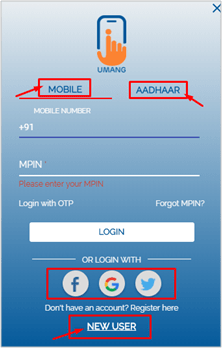 Once you have registered your UAN, then only you will receive details like EPF balance and other such information on your mobile phone via SMS. When you view the EPF balance or EPF passbook, it will be in the form of a statement providing the details of your and the employer’s EPF contribution. The contributions are different as the percentage contribution to the EPF and Employee Pension Scheme (EPS) is defined by the EPFO. Presently, 12% of the Basic salary is the Employee contribution. The employer needs to contribute 8.33% of the Basic salary, limited to Rs 15,000. Hence, the maximum contribution to EPS is Rs 1,250. As the employer needs to match the employee contribution, the balance is invested in the EPF account. For example, the employer and employee decide to contribute towards EPF based on the Basic salary of Rs 20,000, which is above the fixed limit of Rs15,000. 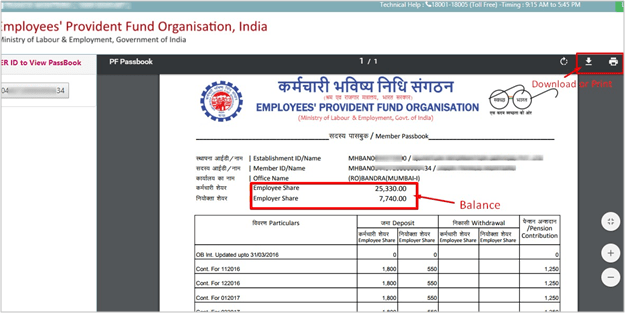 The employee contributed a higher share towards the EPF account (i.e. Rs 20,000 x 12% = Rs 2,400) but the maximum contribution by an employer towards EPS was calculated based on the maximum ceiling limit (i.e. Rs 15,000) and not Rs 20,000. The balance contribution of Rs 2,400, which works out to Rs 1,150 is put in the EPF account. Do note, your KYC details along with UAN are mandatory to know your EPF balance. Your UAN along with Aadhaar Number or PAN Number needs to be registered to know your EPF balance. 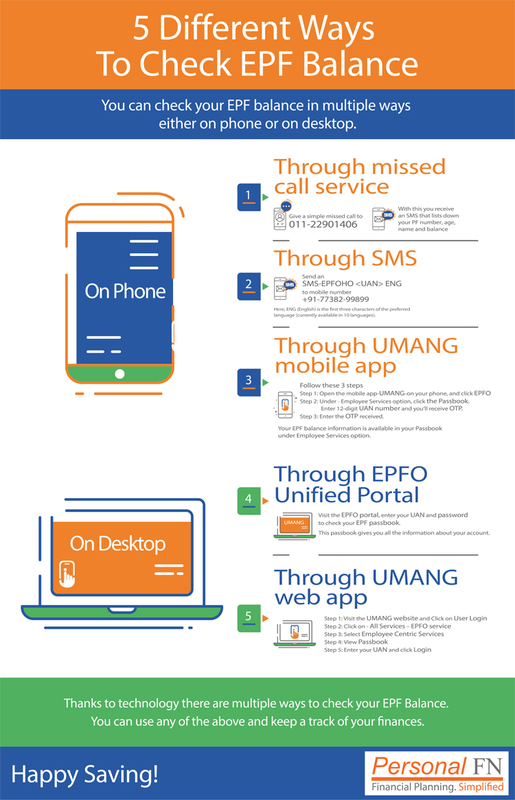 In case you have a valid UAN, your mobile number will also be registered with the EPF department. Giving a simple missed call to 011-22901406 will ensure that you receive an SMS that lists down your PF number, age, and name as per the EPF records. Step 3: Enter the OTP you have received. 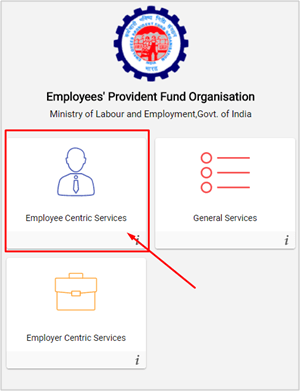 Once it’s verified, you will be shown a screen display of your updated EPF balance information along with personal details like your name, date of birth, Aadhaar number, PAN for tax deduction, last month EPF contribution, etc. For the User Name, you need to enter your UAN. Enter your password and Captcha code to login. Enter the same password used to access the Unified Member Portal. Do note, the EPF passbook will be available after six hours of registration at the Unified Member Portal or activation of UAN. Any change in credentials at the Unified Member Portal will reflect in the passbook only after six hours. 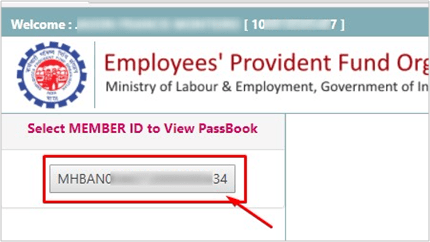 Step 2: Select the Member ID to view the EPF passbook. If you have worked for multiple organisations in the past, multiple Member IDs will be displayed. Choose the Member ID for which you would like to view your EPF balance . Step 3: After clicking on the Member ID, you can view your EPF balance. You can also choose to Print or download EPF Passbook. 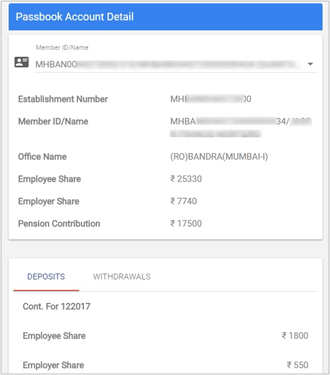 In the EPFO Member Passbook, you will find details of the employer, your name, member ID, and the total contribution of yours and your employers. In the table, the monthly deposit with employee’s and employer’s share is shown, along with the Pension Contribution. If you have made any withdrawals, this will reflect in the adjacent columns. 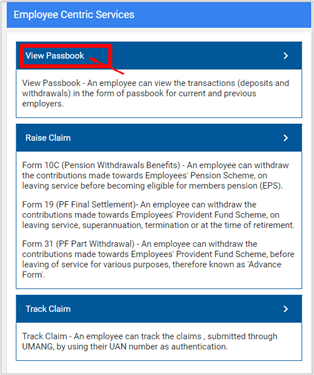 You may download the EPF Passbook in PDF format or print it for your records. 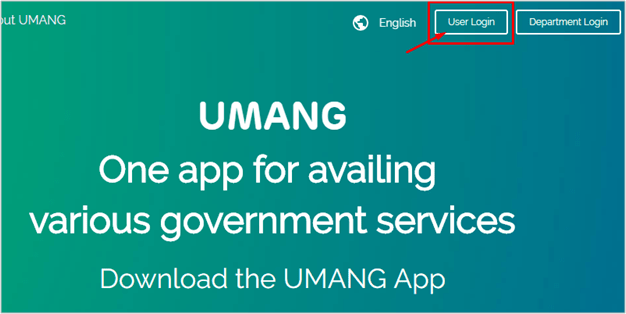 Step 1: Visit the UMANG website: https://web.umang.gov.in/web/#/ Click on User Login available at the top right hand corner. 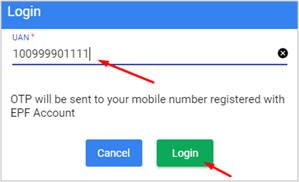 If you already have an account, you can choose to login through your mobile number or Aadhaar. You can even login using Facebook, Google, or Twitter. If you have not created an account, you will need to register first as a new user. To create a new account, you will need to register your mobile number and Aadhaar number to begin using the service. The Aadhaar integration enables users to login to UMANG using their Aadhaar number. The Aadhaar profile information in UMANG is used for eKYC. Step 2: Visit the EPFO service. 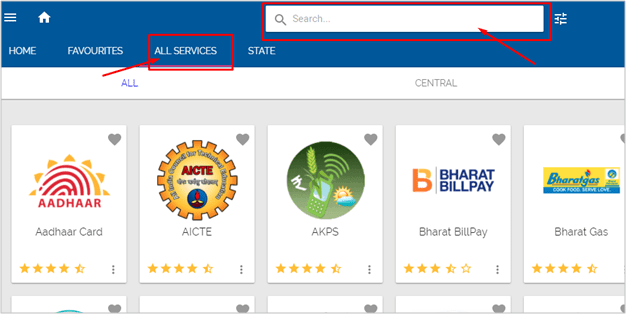 You can either search for the EPFO service or select it from the All Services tab. Step 4: From the list of Employee Centric Services, choose View Passbook. 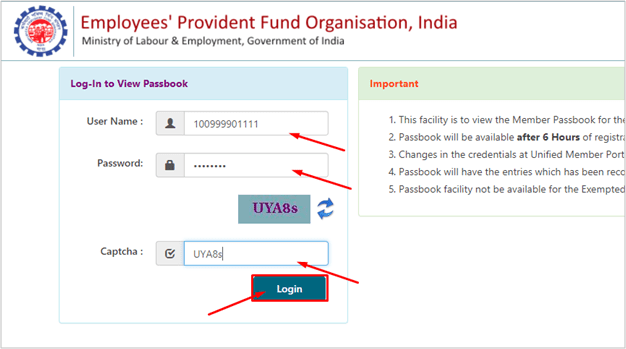 Step 5: To view the EPF Passbook, you need to enter your UAN and click Login. An OTP will be sent to the mobile number registered. Enter it to view the EPF passbook. For salaried individuals, EPF forms a sizable retirement kitty, provided large sums are not withdrawn from the fund for other purposes. With its Exempt-Exempt-Exempt status, one is able to earn a decent income. Though the EPF does not match the wealth creation potential of equity mutual funds, it’s a safe a steady route to invest towards retirement. However, to create a sustainable nest egg, you need to invest wisely with the help of mutual funds. You can also estimate your EPF corpus at the time of retirement or a few years, hence with this easy to use EPF Calculator. You just need to enter the current balance of your EPF account or PF account, EPF interest rate and your Employer’s contribution towards your EPF account to estimate the corpus. Once you have calculated the EPF corpus, you can make up for the shortfall of your retirement corpus with the help of mutual funds. The right mix of assets and a disciplined investment approach will help you build your retirement savings. Unbiased financial knowledge is the key to succeed in achieving all your investment goals before and after retirement. Constructing a portfolio with a stable core of long-term investments and a periphery of more specialist or shorter-term holdings can help to deliver the benefits of asset allocation and offer the potential to outperform the market. The satellite portfolio provides the opportunity to support the core by taking active calls determined by extensive mutual fund research. This strategy will take you on the path to achieve your retirement goals. PersonalFN offers you a great opportunity, if you’re looking for “high investment gains at relatively moderate risk”. Based on the ‘core and satellite’ approach to investing, here’s PersonalFN’s latest exclusive report: The Strategic Funds Portfolio For 2025. In this report, PersonalFN will provide you with a readymade portfolio of its top recommended equity mutual funds schemes for 2025 that have the ability to generate lucrative long-term returns. We highly recommend you to opt for The Strategic Funds Portfolio For 2025.